324/365(+1), a photo by Luca Rossini on Flickr. 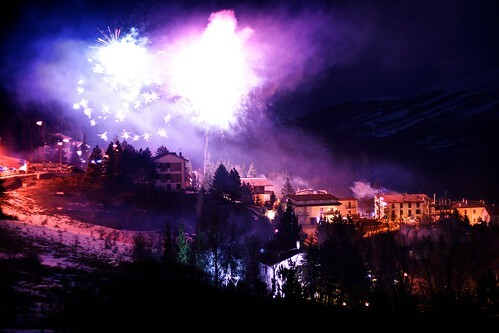 This is how we party the end of the year here at Pescocostanzo, in the Appennini mountains, simply by standing in the terrace, toasting with champagne, while watching the whole town in fire(works). Despite being in the region of Abruzzo, Pescocostanzo is quite close to Naples and many fellows from the city come here during Christmas holidays. Now, Neapolitans are well known throughout the country for going totally postal when it comes to fireworks. And Claudia’s parents apartment has a great view of the whole town and most of the valley, so we enjoyed at least six or seven different firework shows happening around (some of which scarily close). As planned we arrived at home in the late afternoon, Claudia, Agata and myself plus three close friends with their two baby girls, we fixed our stuff and we started cooking, eating, and drinking. Even if we all had some issues, like the kids that got so excited they didn’t want to sleep, or the dinner that I basically screwed up, we still managed to have some very good time together, if only because we are almost family to each other and being together is a nice and warm place is enough of a reason to have a good time. Then midnight arrived, and with it this incredible 2012 left us and a promising but unpredictable 2013 started. The air got quickly filled by the tremendous noise of the fireworks, the bright lights of their explosions, and the distinct smell of powder. After a few minutes the smoke was enough to create this sort of fog over the whole town, which amplified the lights of each explosion, making the scene somehow close to those videos of bombings we see unfortunately so often in the news. Beautiful! I like the detail you were able to capture in the dark mountain off to the right. Looks great in the larger version on Flicker. Good work.